China’s Institute of Public Safety Research at Tsinghua University has announced plans to build a forensic laboratory at Makerere University that will help the institution and the country detect sophisticated crime. The Makerere University Vice-Chancellor Prof Barnabas Nawangwe hailed the partnership. 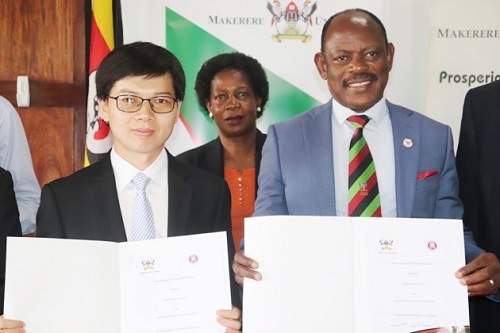 “China has the highest population in the world but they have managed to maintain security in their country because they have the necessary Information Technology to detect threats as they unfold,” Prof Nawangwe said at the signing of the partnership at Makerere University main campus on Monday. He added that with the increasing cases of cybercrime in different organizations and murders across the country, the time to set up security systems is now. “Whereas the government might be getting data from other agencies, the basic content in research is lacking. We are optimistic that with this agreement, we shall offer systematic solutions in this field that will see the government manage security across the country and in the region,” Mr. Oyana said. Following the spate of assassinations of various prominent people who included former Arua Municipality MP Ibrahim Abiriga, former police spokesman Andrew Felix Kaweesa, prosecutor Joan Kagezi and chain murders of women in Wakiso district, President Museveni proposed 10-point security programme that included installation of cameras on highways and towns, fingerprinting of guns, use of drones, ensuring no hoodies for motorbike riders, installing electronic tracking devices on motor vehicles and motorbikes, deployment of 25,000 Local Defence Unit operatives as part of the variety of measures to curb insecurity in the country.